The largest Riverhome available and located in a beautiful, private position with North Easterly aspect, this breathtaking riverfront home will impress with its entertainer's layout, quality, concrete build and desirable, Brisbane river outlook. 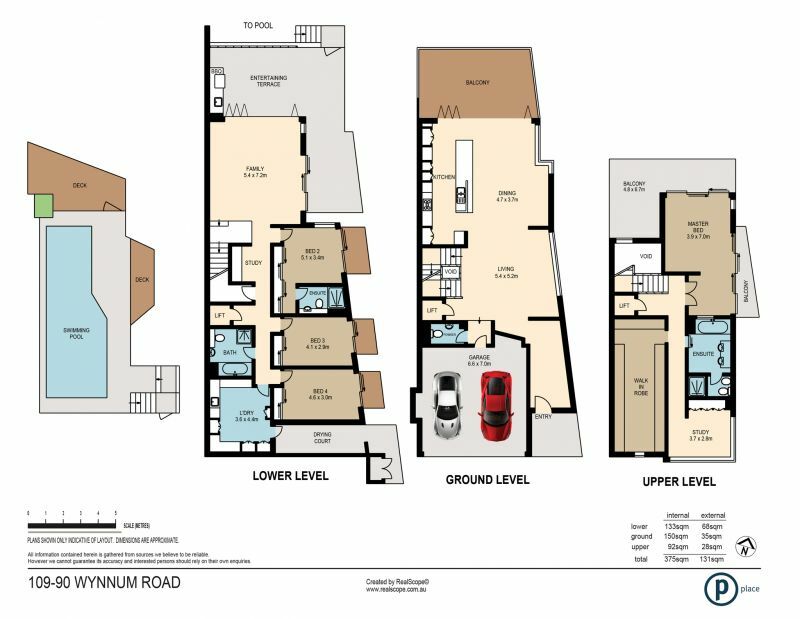 An address where executive family living, architectural precision and unsurpassed designer quality prevail, 109/90 Wynnum Road encapsulates effortless, resort style living. Indulge in 180 degree water panoramas, reaching across the city skyline and Merthyr and New Farm Parks. The home's selection of indoor living and alfresco entertaining spaces maximise space, light and refreshing, river breezes. A gourmet delight, the modern kitchen boasts a range of stone and European appliances and relishes in a central position to the air conditioned formal and informal living and dining rooms and natural, stone glass-framed, alfresco balcony. The lower level of the home is designed for teenagers or guests with huge bedrooms and a large media room which leads out to an alfresco terrace, complete with built-in BBQ. This impressive space showcases sensational river and city vistas, creating a faultless backdrop for relaxed entertaining. Maximising its sensational waterfront position, the residence's four bedrooms are accessible via lift or internal stairs and are serviced by two lavish bathrooms. The master retreat occupies a private, top floor position, boasting exclusive access to a private balcony, an enviable walk in robe, ensuite and study. A catalogue of features include; a double lock up garage, ducted air conditioning, lift access, private marina berth, gymnasium, lap pool and security. Just three kilometres from Brisbane CBD and offering easy access to CityCat and bus services, this exceptionally well positioned home also provides superb convenience within minutes of prestigious private schools, tertiary facilities, parks, and all the attractions the river city has to offer. Undeniably unique in its vision and exclusive in its lifestyle, this esteemed address is in a class of its own. Experience for yourself at inspection today.